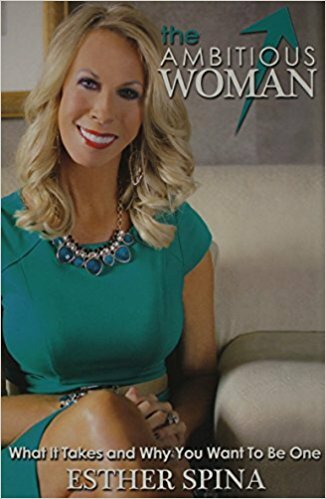 The Ambitious Woman illustrates how ambitious women embody characteristics such as inspiration, empowerment, and motivation to help others accomplish their goals, and create win-win relationships in all areas of life. When you think of the word ‘ambitious’, what comes to mind? Power hungry? Getting ahead no matter what it takes? Someone who runs over others to accomplish their goals? While many people may have a negative view of what it means to be ambitious, author, motivational speaker and women’s movement leader, Esther Spina, is not one of them. In fact, in The Ambitious Woman, Esther shows that Ambitious Women are found in all walks of life – the famous and the not-so-famous. They embody characteristics such as inspiration, empowerment and motivation to help people accomplish their goals. Ambitious Women can be humble and loyal; they are disciplined and have a never-give-up attitude. Real and genuine ambitious people care about others; they are not self-centered. They are “ambitious” about seeing others succeed, and creating win-win relationships in all areas of life. Using profiles of people such as Diana Nyad and Barbara Walters, The Ambitious Woman offers contemporary illustrations of people who have lived ambitious lives and what we can learn from them. The book also profiles ambitious people who are close to the author, people who live with passion, confidence and consistency in their everyday lives. Women from all walks of life will find ambitious characteristics to strive for, ones that will improve their lives, their relationships, and who they are deep down. When you become an Ambitious Woman, you, too, can help others change their lives!